The NATO ADVANCED SUMMER INSTITUTE ON THEORETICAL PHYSICS 1981 st was held in Freiburg, Germany from August 31 until September 11th 1981. It was the twelfth in a series of Summer Institutes organized by German Universities. 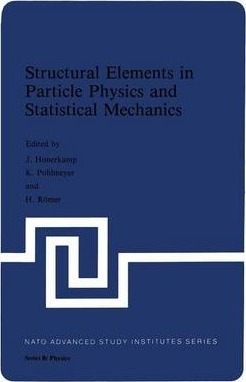 Its main objective was a thorough comparison of structures and methods of two different branches of Theoretical Physics, name- ly Elementary Particle Physics and Statistical Mechanics, and the idea was to exhibit the structural similarities, to trace them until their origins, to compare solution and approximation schemes and to report on those new results and methods in either of the two branches which are indicative of an intimate connection between them. Thus stimulation of a deeper understanding and development of new Methods could be hoped for in both fields. The contributions to the Summer Institute - lectures and seminars - are contained in this volume. One group of them gives concise up-to-date information on basic topics in Statistical Mechanics and Phase Transitions, Dynamical Systems, Solvable Lattice Models and Lattice Gauge The- ories. A second group is devoted to special topics which illustrate the interrelationship between Statistical Mechanics and Elementary Particle Physics, like topological quantum numbers on a lattice, model studies on the confinement problem, etc. Supplementary information on experimental implications and on neighbouring fields is provided in a third group. Illustrations note IX, 378 p.
Connectivity: a primer in phase transitions and critical phenomena for students of particle physics.- Algebraic aspects of exact models.- Elementary methods for statistical systems, mean field, large n, and duality.- Quantum scattering transformation.- Phases in gauge theories.- Unification of gauge and gravity interactions from compositeness.- Strong CP violation and axions.- Non-linear mechanics of a string in a viscous noisy environment.- Some new integrable models in field theory and statistical mechanics.- Calculating the large N phase transition in lattice gauge theories.- Excitation spectrum of ferromagnetic xxz-chains.- Computer simulations of a discontinuous phase transition and percolation clusters in the two-dimensional one-spin-flip Ising model.- Polyacetylene: a real material linking condensed matter and field theory.- The hidden fermions in Z(2) theories.- Remarks on alternative lattice actions and phase structure of lattice models.- Finite-size scaling theory.- Anderson transition and nonlinear ?-models.- Functional integration for kinks and disorder variables.- Continuum (scaling) limits of lattice field theories (triviality of ? ?4 in d(=)> 4 dimensions).- Schroedinger representation in renormalizable quantum field theory.- All self-dual multimonopoles for arbitrary gauge groups.- Renormalization group aspects of 3-dimensional pure U(1) lattice gauge theory.- Mass splitting of the pseudoscalar mesons by Monte Carlo technique.- Radiative symmetry breaking in grand unified theories.- Ground state metamorphosis for Yang-Mills fields on a finite periodic lattice.- Lattice Fermions and Monte Carlo Simulations.